To a large extent, the internal resistance, also known as impedance, determines the performance and runtime of a battery. If measured with an AC signal, the internal resistance of a battery is also referred to as impedance. High internal resistance curtails the flow of energy from the battery to the equipment. 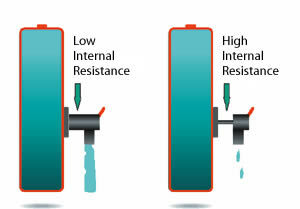 A battery with simulated low and high internal resistance is illustrated below. While a battery with low internal resistance can deliver high current on demand, a battery with high resistance collapses with heavy current. Although the battery may hold sufficient capacity, the voltage drops to the cut-off line and the ‘low battery’ indicator is triggered. The equipment stops functioning and the remaining energy is undelivered. Figure 6-2: Effects of impedance on battery load. A battery with low impedance provides unrestricted current flow and delivers all available energy. A battery with high impedance cannot deliver high-energy bursts due to a restricted path, and equipment may cut off prematurely. NiCd has the lowest internal resistance of all commercial battery systems, even after delivering 1000 cycles. In comparison, NiMH starts with a slightly higher resistance and the readings increase rapidly after 300 to 400 cycles. Maintaining a battery at low internal resistance is important, especially with digital devices that require high surge current. Lack of maintenance on nickel-based batteries can increase the internal resistance. Readings of more than twice the normal resistance have been observed on neglected NiCd batteries. After applying a recondition cycle with the Cadex 7000 Series battery analyzer, the readings on the batteries returned to normal. Reconditioning clears the cell plates of unwanted crystalline formations, which restores proper current flow. Li-ion offers internal resistance characteristics that are between those of NiMH and NiCd. Usage does not contribute much to the increase in resistance, but aging does. The typical life span of a Li-ion battery is two to three years, whether it is used or not. Cool storage and keeping the battery in a partially charged state when not in use retard the aging process. The internal resistance of the Li-ion batteries cannot be improved with cycling. The cell oxidation, which causes high resistance, is non-reversible. The ultimate cause of failure is high internal resistance. Energy may still be present in the battery, but it can no longer be delivered due to poor conductivity. With effort and patience, lead acid batteries can sometimes be improved by cycling or applying a topping and/or equalizing charge. This reduces the current-inhibiting sulfation layer but does not reverse grid corrosion. Figure 6-3 compares the voltage signature and corresponding runtime of a battery with low, medium and high internal resistance when connected to a digital load. Similar to a soft ball that easily deforms when squeezed, the voltage of a battery with high internal resistance modulates the supply voltage and leaves the imprint of the load. The current pulses push the voltage towards the end-of-discharge line, resulting in a premature cut-off. When measuring the battery with a voltmeter after the equipment has cut off and the load is removed, the terminal voltage commonly recovers and the voltage reading appears normal. This is especially true of nickel-based batteries. Measuring the open terminal voltage is an unreliable method to establish the state-of-charge (SoC) of the battery. A battery with high impedance may perform well if loaded with a low DC current such as a flashlight, portable CD player or wall clock. With such a gentle load, virtually all of the stored energy can be retrieved and the deficiency of high impedance is masked. This chart compares the runtime of batteries with similar capacities under low, medium and high impedance when connected to a pulsed load. The internal resistance of a battery can be measured with dedicated impedance meters. Several methods are available, of which the most common are applying DC loads and AC signals. The AC method may be done with different frequencies. Depending on the level of capacity loss, each technique provides slightly different readings. On a good battery, the measurements are reasonably close; on a weak battery, the readings between the methods may disperse more drastically.